Sagie Pillay of the National Health Laboratory Service (NHLS), South Africa, recently spoke with us about his roles in NHLS and ASLM2014, the collaboration between NHLS and ASLM, and his hopes for the future of African laboratory medicine. 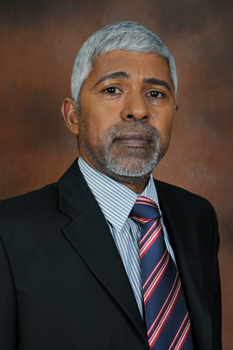 Mr. Pillay has extensive experience in national and international hospital and laboratory leadership and management, and possesses both a master’s degree in business administration (University of Liverpool, UK) and a master’s degree in health management, policy and planning, and health economics (University of Leeds, UK). Can you tell us a little about your professional background and current projects? I am currently the CEO of the National Health Laboratory Service (NHLS) and also serve on a few NGO Boards. As CEO of NHLS, a government-owned entity, I help run the largest diagnostic pathology laboratory service in South Africa. NHLS serves the entire South African public health system, as well as Correctional Services and the Military Health Services. Servicing about 80% of the South African population, NHLS has a staff of over 6,500 people in 349 laboratories across the country. The three mandates of NHLS include laboratory services, production of all pathologists for the country, and the undertaking of relevant research to inform service innovation and affordability. In the next five years, NHLS is placing a strategic focus on reviewing and re-engineering the healthcare service model, making services more affordable, developing human resource norms to inform the service model, and creating a human resources plan for the country’s diagnostic laboratory services. What would you say have been the major highlights of your career so far? Together with the NHLS team, we launched the largest HIV and TB testing programme in the world. Under my leadership, NHLS has established technology available for AIDS monitoring, introduced a CD4 programme, reduced the cost of providing CD4 tests, and achieved four million CD4 tests in 2012 alone. We are currently exploring more affordable solutions for diagnostics, performing a study on lowering CD4 count in children, rolling out the GeneXpert diagnostic platform in-country, launching TB programmes in South African mines in collaboration with partners, and working to improve turnaround times for diagnostic results. Please tell us a little about your role in the ASLM2014 conference. How did you become involved in this role, and what are your expectations of the conference? I am currently the co-chairperson for this much awaited ASLM2014 conference. NHLS is a founding member of ASLM and we have representation on the Board. I was extremely excited by the vision of ASLM and by our involvement with the other partners. Laboratory medicine is seriously under-valued on the African continent, even though it is at the centre of the health system. Having worked in East Africa previously, I knew getting involved with ASLM was the right thing to do. I was compelled to action by the idea of Africans collectively taking the lead to build a pan-African movement to raise the profile of laboratory medicine, mobilise resources, lobby Ministers of Health to place laboratory medicine on the health system strengthening agenda, and develop programmes to train laboratory professionals. Wherever you go in Africa, people are talking about the upcoming ASLM2014 conference and looking forward to attending. The ASLM leadership has kept the momentum going between the 2012 and 2014 conference. In my experience, many of us have engaged with various committees, and attended workshops and planning sessions to give tangible expression to the 2012 Ministerial Call for Action. What was your involvement in ASLM2012? What did you enjoy most about the 2012 conference, and what can be improved upon in 2014? What would you like ASLM to accomplish in the coming years to support African laboratory scientists? NHLS provided behind-the-scenes support for this landmark conference. It was a huge privilege for the first conference to be held in South Africa and for the NHLS to be part of the organising committee. The 2012 conference was well attended, made up of eminent African academics, the continent’s leading laboratory professionals, heads of laboratory services and healthcare organisations, managers, senior representatives from other countries, NGOs and others. Other highlights from the conference included networking and collaboration opportunities, relevant and interesting workshops, the presentation of balanced information on the diagnostic technology pipeline for Africa, and the signing of the Ministerial Call for Action. It was also inspiring to realise that we all share similar challenges and can learn from each other’s successes and experiences. 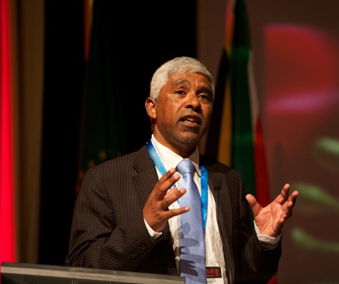 My personal outcome for the ASLM2012 conference was getting support from country representation, and assessing the need for ASLM. An equally important outcome was getting political commitment through calls of action. The energy and excitement throughout the conference was palpable. More than nine Ministers demonstrated strong political support for laboratory strengthening, and the conference exceeded expectations. My expectation for the ASLM2014 conference is to receive an update on progress since the last meeting, to perform a gap analysis of our goals versus our actual achievements, and to discuss remaining gaps in the achievement of our objectives. Furthermore, I look forward to hearing about latest country experiences on HIV/TB programme implementation and discussing new and upcoming technological solutions for the scale-up of HIV/TB interventions. How can ASLM and NHLS further collaborate to advance laboratory medicine and public health in Africa? ASLM and NHLS have established a good relationship dating back to ASLM’s launch. There are already four areas on which NHLS and ASLM are collaborating. These include establishing the Pan African Harmonization Working Party (PAHWP) to improve regulatory harmonisation for diagnostics within economic zones; establishing an international network of proficiency testing providers to support SLIPTA (the Stepwise Laboratory Quality Improvement Process Towards Accreditation) and other quality improvement and accreditation programmes; fostering the establishment of an African Network of Public Health Laboratories; and strengthening evidence-based health policy development in Africa. Diagnostic tests provide the gateway to HIV care and enable clinicians to monitor treatment outcomes to determine treatment success. Improving access to tests and strengthening laboratory health systems must become a key imperative in the efforts to strengthen health systems across the continent. ASLM must expand its influence by building on its partnerships with UNAIDS, WHO and donors, to mobilise for increased resources for laboratory medicine. Concurrently, ASLM should continue lobbying Ministries of Health to promote country ownership by setting targets for higher health budgets. A portion of health budgets should be dedicated to investments in laboratory infrastructure, the training of laboratory professionals, and investment in other laboratory health systems strengthening initiatives. This way, we will be able to enhance the ability of laboratory medicine to contribute to rapid treatment scale-up and support for the rest of the testing needs of clinicians and patients. Appropriate use of diagnostic laboratory services should not be seen as a cost driver, but rather as a cost saver for the overall health system. ASLM is an African organisation led by Africans. Let the Africans take the African agenda into their hands. Africa’s future is in our hands. An HIV-free tomorrow is within our reach, and as Africans we must collectively take the lead and deliver this future under the banner of ASLM. Originally published in the August 2014 issue of Lab Culture newsletter.